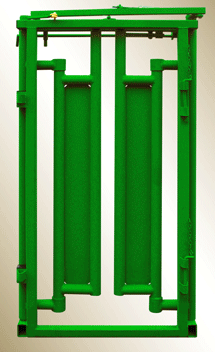 Besides the bi-fold alley gate, we also offer a Slide Gate as another option to add to your adjustable alleyway. 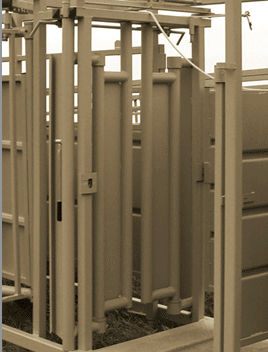 The bi-fold alley gate, or “slick door” from Real Tuff Livestock Equipment is an excellent addition to any livestock or ranching operation. This piece of equipment is available either as a stand-alone unit or part of an alley. In addition, cattlemen can operate the slick door from either side. Our bi-fold alley gate also boasts the fastest opening and closing alley gate available, which is advantageous when time is of the essence. We love this piece of equipment so much that it comes standard on all of our Squeeze Chutes and Complete Portable Systems. Many customers an extra slick door to place between their straight adjustable alley and the no-corner crowding tub. This easy to use piece of equipment also stands the test of time because as always, construction and material of this equipment is tested and approved by the experts at Real Tuff. We know livestock equipment and you need tough material. 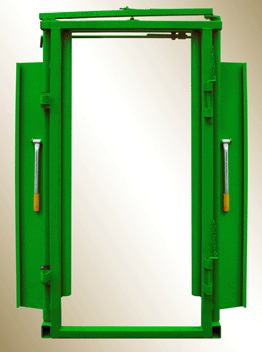 Therefore, our Bi-Fold Alley Gate “Slick Door” goes above and beyond the call of duty and delivers exceptional results. We believe you will love the slick door as much as we do!